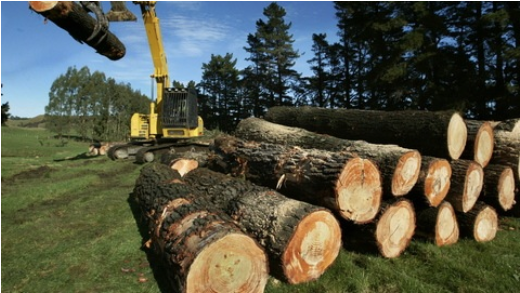 New Zealand log prices have lifted from a two-year low. New Zealand export log prices have lifted from a two-year low as Chinese importers have resumed buying. China is New Zealand’s largest log market. Local returns are bolstered by a decline in the New Zealand dollar and cheaper shipping costs as a result of increased capacity. The average wharf gate price for New Zealand A-grade logs fell to $76 a tonne in July, the lowest since April 2012, but have since increased to $80 a tonne in August and $88 a tonne in September, according to Agrifax’s monthly survey of exporters, forest owners and sawmills. This month’s survey, is also likely to show another gain. Despite construction activity slowing, China is still buying. “We saw that construction activity was not picking up at all,” said Luketina, who visited Chinese ports and sawmills as part of a tour organised by Canadian-based International Wood Markets Group. New Zealand wharf gate prices are being distorted by the impact of currency and shipping, with some exporters receiving $110 a tonne this month, Luketina said. The higher wharf gate price “is likely to mean more people are going to be exporting even though the inventories in China haven’t actually decreased significantly”, he said. Glendene-based The Pallet Company, which manufactures pallets and crates, won the Westpac Supreme Business Excellence Award after impressing judges with its all round business performance. ARHT GOLF DAY 2016- RECORD YEAR! The Pallet Company was pleased to be once again the major sponsor for the ARHT Golf day held at Aviation Country Club. The Pallet Company is once again the proud sponsor for the Auckland Rescue Helicopter Trusts Annual Charity Golf Day! Date: 3 November 2017, at the Maungakiekie Golf Club.